All it took was a wonderful evening with Prosciutto di San Daniele, Grana Padano and Dan Doherty for a cheese, ham and wine workshop (be still my beating heart) to persuade me. I learnt all about its history, its properties, how to nibble it, how to cook with it and how to get hold it. And now I’ll share it all with you. Grana Padano dates back approximately 900 years ago to the monastery of Chiarvalle, just a few kilometres from Milan. According to church records from 1135, the cheese was made in special copper cauldrons by monks who called it ‘Caseus Vetus’ (old cheese). For the general population, unfamiliar with Latin, the name ‘Formaggio di Grana’ or ‘grainy’ cheese caught on. Other regions began to produce their own ‘grana’ cheese in Lodi, Parma, Milan etc. It wasn’t until 1951, when the cheese was first regulated, that these cheeses were distinguished into two categories – Grana Padano (which is produced across the Po Valley) and Parmiggiano Reggiano (which is produced in Emilia Romagna). 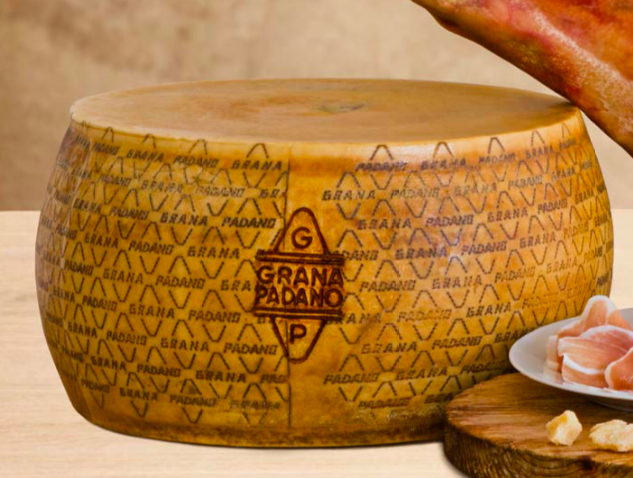 In 1996 Grana Padano finally achieved PDO status and it is now tightly regulated by the Grana Padano Consortium. Grana Padana is made exclusively from raw cow’s milk, specifically from cows in the Po valley which have been milked twice a day and fed according to specific guidelines. It can only be produced in Lombardy, Veneto, Emilia Romagna (province of Piacenza), Trentino and Piedmont. The cheese is made in traditional cylindrical copper lined vats which produce two twin wheels holding around 1000 litres of milk. The milk is heated and congeals once natural whey and rennet are added. The curd is chopped manually into small grains with a spino (giant whisk), reheated, consistently stirred at 56 degrees and left to rest until the mass has settled at the bottom. Following this, a pala (giant wooden spatula) is used to divide the mixture into two equal halves. Each wheel is wrapped in a linen cloth, transferred to a flat surface and enclosed in a ‘cheese belt’, which gives it a cylindrical shape. At this stage, the serial number of the factory, province, production month and year are imprinted into the wheel to ensure traceablility. The cheese wheels are placed in saline solution for 14-30 days and, after drying, the maturation begins, which can last anywhere over nine months (usually not much longer than twenty months). During this period the cheese is cleaned and turned every two weeks by specialist machines. After maturing, the Grana Padano cheese wheels are checked with a hammer, needle and sonde. If you feel like that didn’t make sense, see YouTube video here which I love so much I’ve watched it approximately 42 times. How do I know I’m getting the proper stuff? Twenty months and over (Riserva) which has a distinct grainy structure and a consistent straw colour. This goes best with nuts, fruits and chutneys. Great. Now how do I use it? Grana Padano needs less time to mature than Parmiggiano Reggiano, so as a result it is far more delicate and subtle in taste. The youngest vintage (9-16 months) works wonderfully in gratin dishes, creamy sauces and grated on to salads and cold meats. The Riserva cheese (aged for at least twenty months) is utterly delicious baked into crispy wafers, stuffed in to vegetables and meat, sprinkled on to risotto and slapped on a cheese board with local salumi, chutneys and breads. You may have to find an Italian deli or specialist shop to find the younger stuff, as most supermarkets in the UK serve riserva exclusively. I was lucky enough to receive instruction from the Consortium and Dan Doherty on ways to work with Grana Padano and I've included my favourite recipe (created by the talented Dan Doherty) here. For more recipe ideas, the Consortio di Grana Padano website is a brilliant resource, tried and tested by people who know and love this glorious cheese best.